There are also preserved the grace-flowing Skulls of many Saints: Sts. Alypios Kionatou (Koutloumousiou), Andrew Bishop of Crete (Vatopaidi), Bartholomew the Apostle (Karakalou), Basil the Great (Great Lavra), Blasios Bishop of Sebaste (Konstamonitou), Gregory the Theologian (a portion of his Skull in Vatopaidi), Gregory of Nazianzus (Gregoriou), Gregory the Illuminator (Great Lavra), Dionysios the Areopagite (Docheiarou), Dionysios of Olympus (Docheiarou), James Adelphotheos (Esphigmenou), John Chrysostom (Skete of St. Andrew, Vatopaidi), John Koukouzelis (Great Lavra), Kerykos the Martyr (Gregoriou), Kyriake the Martyr (Dionysiou), Makarios the Righteous Martyr (Skete of St. Anna), Matrona the Martyr (Zographou), Mercurios the Martyr (a portion of his Skull at Great Lavra), Michael Bishop of Synnadon (Great Lavra), Modestos Bishop of Jerusalem (Vatopaidi), Neilos the Myrrh-streamer (Great Lavra), Niketas the Martyr, the Goth (Iveron), Nikodemos of the Holy Mountain (Cell of the Skourtaion), Panteleimon the Healer (a portion of his Skull at St. Panteleimon), Parthenios Bishop of Lampsanou (Esphigmenou), Stephen the Archdeacon (a portion of his Skull and jaw at St. Panteleimon), Tryphon the Martyr (Xenophontos) Photini the Samaritain Woman (Simonopetra), Christopher the Martyr (Karakalou). 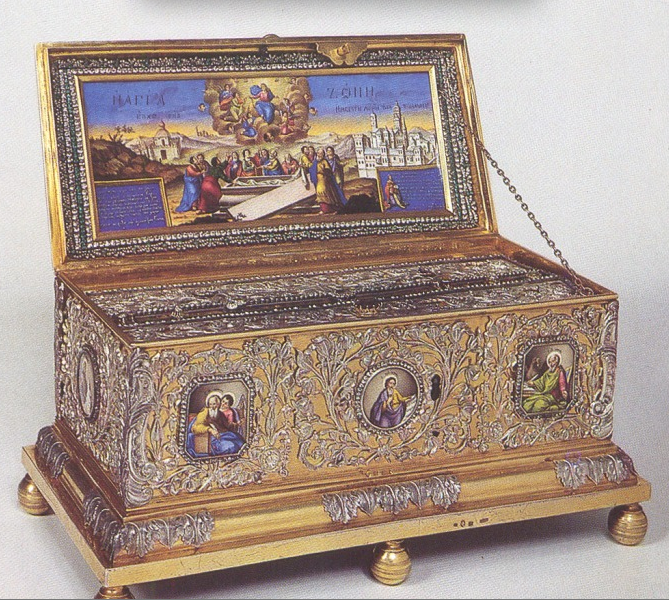 There are also preserved the following Relics of the Saints: The jaw of St. Charalampos (Koutloumousiou), the incorrupt right hand of St. Nikephoros of Constantinople (Chilander), the right hand of St. Marina the Martyr (Xenophontos), the incorrupt left hand of St. Mary Magdalene (Simonopetra), the right hand of St. Maximos the Confessor (St. Paul), a shoulder of St. Constantine the Great (Konstamonitou), the right hand of St. Eleutherios the Hieromartyr (Dionysiou, the right hand of St. Barbara (Simonopetra), the incorrupt right hand of St. John Chrysostom (Vatopaidi), etc. The St. John the Baptist’s foot, and arm of St. Euthymius the New. Both are kept in St. Panteleimon monastery. Dear Custodians of the Sacred Relics: I write from the USA, where I am now a cathecumen as well as a Scholar-in-Residence at The Holy Transfiguration Monastery in Greater Boston. Over the past year, since my mother, whose baptized Orthodox name was Photine, passed away, I have returned again and again and again to her hagiography ~ which encourages me every day in some way. 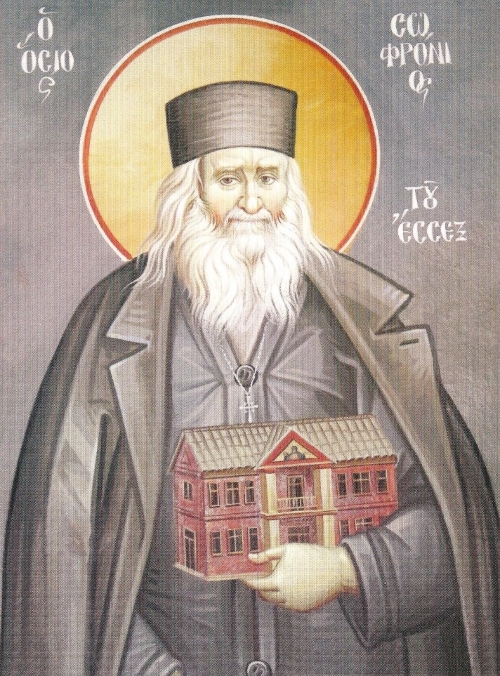 I have in my possession the account from The Great Synaxaristes, which is constructed from the hagiography of Nicodemus of the Holy Mountain. I was moved by the Lord 5 months ago by this testimony, to such an extent that it may very well be that my life’s work will be connected with the legacy of St. Photini, in some significant ways. I am a theologian, with 7 degrees in Theology, at at this juncture now stand on the threshold of a whole new life in Christ as an Orthodox Christian. I write, with some important requests. 1) Can you please tell me where the sacred relics of St. Photeini, The Samaritan Woman of John 4, are, at Mount Athos? Which monestaries are they in? Do you know if any of her family’s relics are there in the monastaries as well? 2) Can you tell me if the monasteries have any copies or original manuscripts of her hagiographies? I very much would appreciate any assistance you could offer in helping me to get started on this quest for original documents and relics of St. Photine and her family and friends. Yours in Christ, Rev. Paul Dumas, Ph.D., Scholar-in-Residence, Holy Transfiguration Monastery, 278 Warren Street, Brookline, MS, 02445, USA. Cell phone: 509-899-2327. My email is: paul.dumas55@gmail.com Thank you! Paul, the sacred leg of Saint Photini (the Samaritan) is kept in the Holy Monastery of Iviron (Iveron) at Agion Oros (Mount Athos). I am unaware of any original manuscripts at Mount Athos, however the most likely place these would exist would be Saint Catherine’s Monastery at Mount Sinai or the Monastery of Saint Savvas in Palestine. Hello Mario, I’m sorry, we can’t help you on this one (we are not as close to the monasteries as it might look), but a lot of our Orthodox/Greek readers visit the Holy Mountain regularly and they may have the information need? I was so much touched to read about the Holy Belt (Zoni) of Mother Mary. My whoe family (10 of us) read and experienced the joy of coming in touch with Mary thu’ this Holy Zoni. Especially great joy & hope that if we ask for a piece of this Holy Zoni, we will receive it If we use with faith, childless woman will be blessed with a child. My son & daughter-in-law, Joe/Mich are married for 8 years, so far no issue. Pl. send me a piece of this Holy Zoni for my daughter-in-law Michelle. We have great devotion to ou Mother Mary and believe that thu’ the touch of this Holy Zoni, all obstacles/hurdles/deficiency in Michelle’s conceiving will disappear and she will be blessed with gift of a child. There is another part of the Belt of the All-Holy Mother of God at the Trooditissa Monastery at Kato Platres, near Limassol (Cyprus), which – contrary to the Holy Mountain – can be visited by women too. Thanks for taking your precious time to reply to my request. I am very delighted to know 1000 yr. old Vine still exists. Yes, St. Rita’s rose plant is 600 yr. old.St. Rita’s Monastery, Cascia had sent me the powder of the 600 yr. dried Rose petals, which healed my grandchild from food allergy. God Who created this marvelous Universe can preserve & create anything – nothing is impossible for Him!We are privileged He is our Great God!!! May the Holy Trinity bless you, your dear ones and the work/mission that you are doing. Thanks for the information you have so kindly given me re: Holy Belt (Zoni) of Mother Mary at the Trooditissa Monastery. Blessed are those who can visit it. I can only request for a piece or any medal touched to it. Many thanks, and may the Holy Trinity bless you, your dear ones and your work/mission too.